The soft tissue sarcomas are a group of tumors that originate from the connective tissues of the body. They include many different types of sarcoma (fibrosarcoma, hemangiopericytoma, neurofibrosarcoma (nerve sheath tumor), rhabdomyosarcoma, malignant fibrous histiocytoma, liposarcoma, and others). These tumors have similar biologic behavior; therefore, the exact name of the sarcoma is not usually as important as the histologic grade. The histologic grade ranges from I to III and is an evaluation of how rapidly the tumor is dividing along with other criteria that indicate how likely it will spread (metastasize) to other parts of the body. These tumors usually appear as a firm to semi-firm lump in the deep layer of the skin, under the skin or in the musculature. They are often noticed by the owner but are sometimes found by the veterinarian during a routine exam. These lumps are usually non-painful and have normal skin overlying them. They can occur anywhere on the body but commonly develop on the limbs, chest or abdominal wall. A needle aspirate of the mass is a quick and cost-effective procedure that can sometimes give a preliminary diagnosis of sarcoma. An aspirate cannot determine tumor type or histologic grade. In addition, because these tumors are made of connective tissue, sometimes they hold tightly together and an aspirate yields no cells. A tissue biopsy is then necessary to achieve a definitive diagnosis and to determine grade. Unless the tumor is small and easily removed, a biopsy using a local anesthetic will be collected prior to removal of the tumor. Soft tissue sarcomas are very invasive into the surrounding normal tissue, and the tumor is usually larger than what is visible or palpable. As a group, these tumors have a relatively low metastasis rate to other organs, but this rate is dependent on the histologic grade of the tumor. Grade I and II tumors have a less than 20% chance of spreading. Grade III tumors metastasize in about 40-50% of patients. Some combination of surgery, radiation therapy and chemotherapy may be recommended as part of the treatment plan. Surgery is the most frequent treatment recommended for soft tissue sarcomas. It is important to remove the tumor in its entirety along with a wide margin of normal appearing tissue. This may require removal of muscle fascia, muscle, or bone to achieve good surgical margins. In many cases, a CT scan is recommended prior to surgery to better define the extent of tumor. After surgery, the entire block of tissue is submitted for evaluation. A pathologist will determine tumor type, histologic grade, and whether the tumor was completely removed. If the tumor has been completely removed, there is a very good chance it will not recur in the same location. If cancerous cells remain at the surgical site, further treatment is recommended to delay recurrence. However, the time to recurrence without treatment can sometimes be greater than a year. Radiation therapy is another form of treatment that focuses its effects in just one area. When radiation therapy is used exclusively to treat bulky tumors, it is rarely curative but can slow the progression of the tumor. It is sometimes used alone when surgery is not an option. Radiation therapy is much more effective when combined with surgery. It can be used to make a tumor smaller prior to surgery (which hopefully makes the surgery less extensive). 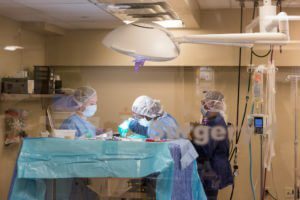 In other instances, it is very helpful after surgery in cases where tumor cells extend to or beyond the surgical margins. Because radiation is administered as a beam directed at the entire area of the tumor (similar to a flashlight shining on the area), its effects on the microscopic tumor cells are focused within that treatment field alone. 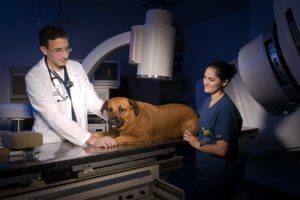 In some studies, 80-90% of dogs have no tumor recurrence over a one to three year period. The rate of metastasis to other organs is low with grade I and II tumors, and chemotherapy is not recommended for patients with these types of tumors. Because the rate of spread with grade III tumors can be up to 50%, chemotherapy after surgery or radiation therapy or both should be considered. Chemotherapy is most effective when it is used before tumor metastasis is visible. If treatment is postponed until metastases are visible, the chance of chemotherapy improving prognosis is greatly reduced. The goal of chemotherapy is to delay or prevent the development of these microscopic tumor metastases into tumors that are large enough to cause clinical problems.